Visitors examine aircraft in White Hangar at Drake Field in Fayetteville, Arkansas, one of only a dozen remaining WWII-era aircraft hangars. Fayetteville, Arkansas, (population 67,158) was established in 1834 when Congress authorized Washington County to sell 160 acres to underwrite the building of a proper courthouse. Much of the original town was destroyed by fire during the Civil War. Fayetteville was chosen as the site for the University of Arkansas in 1871, which helped redevelop the town. By the 1890s, Fayetteville was a hub for prosperous tourism, lumber, and fruit-processing industries. Between 1990 and 2000, Fayetteville was part of the sixth fastest growing areas in the country, due in large part to the growth of Wal-Mart, Tyson, and J.B. Hunt. Recognized as one of the most livable cities in America, Fayetteville now serves as a cultural center in the region. 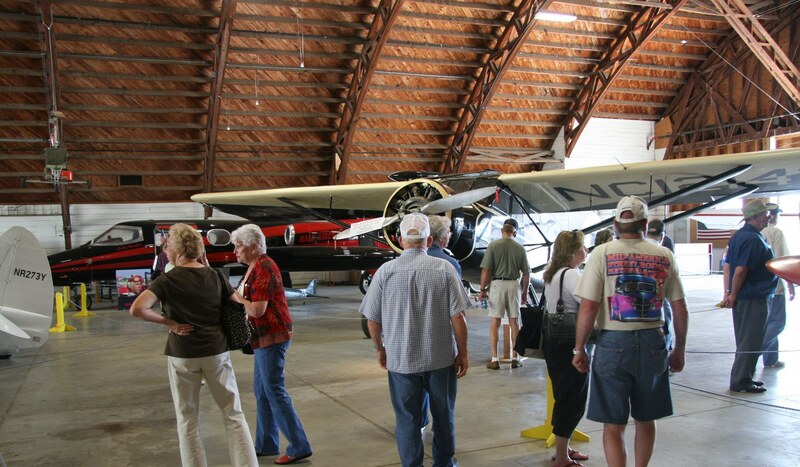 White Hangar at Drake Field is one of only a dozen existing WWII-era aircraft hangars. The hangar, placed on the Arkansas Registry of Historic Places in 1996, represents the resourcefulness exhibited by builders during wartime. Fayetteville’s Historic District Commission worked with the Air Museum Board to ensure that this important artifact of Fayetteville history was safeguarded during the construction of the Arkansas Air Museum. The museum opened its doors in 1986 as the state’s first and largest museum dedicated to aviation, and features a collection of open cockpit biplanes and closed cockpit monoplanes used by pioneer aviators. A partnership between the University of Arkansas and the city, the Clinton House Museum opened to the public in 2005. This home of former President Bill Clinton and current Secretary of State Hillary Rodham Clinton features memorabilia, a replica of Mrs. Clinton’s wedding dress, and the president’s earliest speeches. The museum has received more than 4,000 visitors and is actively involved with the Fayetteville School District. The Washington County Historic Society offers outreach programs to about 1,000 school children, including living history presentations and tours of three historic properties. Headquarters House was built in 1853 and remained relatively unscathed through the Civil War Battle of Fayetteville, fought on its front lawn. The battle is commemorated every April on the grounds with a home tour, period dancing, and a presentation on Union and Confederate artifacts. Lunch is provided by participants who compete in a Dutch oven cook off, offering guests sample food made with historic cooking methods. The law office of Archibald Yell, second governor of Arkansas, was constructed in 1835 and is now on the Headquarters grounds. The Ridge House preserves the original log cabin structure walls within the current house. The Fayetteville City Council adopted a historic preservation ordinance in 2008, which includes design guidelines, nominating structures and districts to the National Register of Historic Places and advising owners of historic properties about preservation. In addition, the Historic District Commission staff conducts design reviews to ensure ordinance procedures are followed. The Northwest Heritage Trail, a regional network of bike and pedestrian facilities, connects residents to the area’s rich heritage and recreational and cultural assets. The trail highlights three historic routes and has been featured in Arkansas City and Town and True West magazines. Various maps and brochures outline the routes.